Kale is a hearty green. It is tough and fibrous and people think you have to cook it to make it palatable. 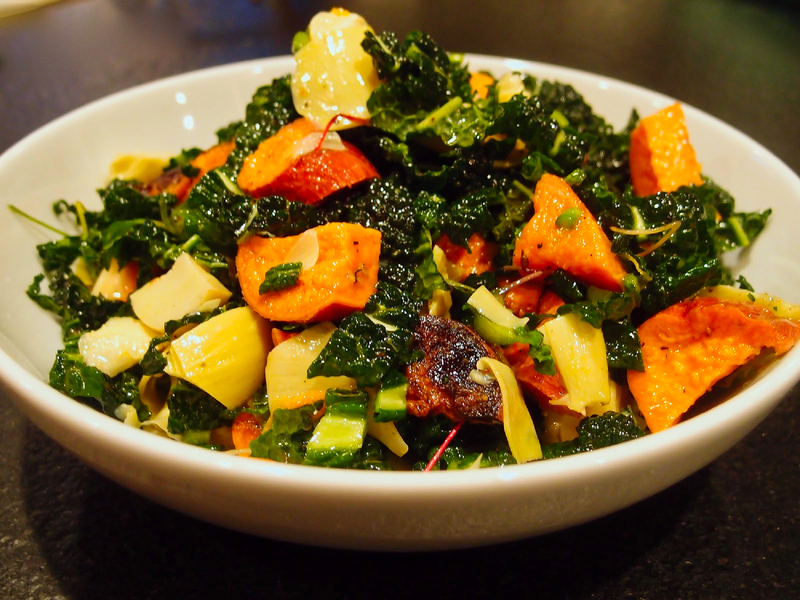 But kale can be fabulous raw, in big-time cold weather salads that double as a meal. 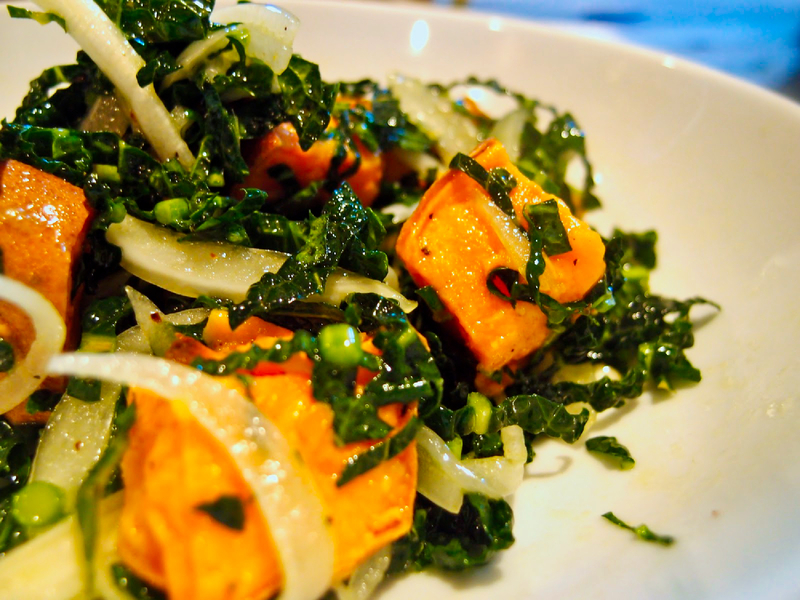 One of my favorite combinations is finely shredded raw Lacinato Kale (also called Tuscan, Cavolo Nero, or Dinosaur kale) with roasted sweet potato. 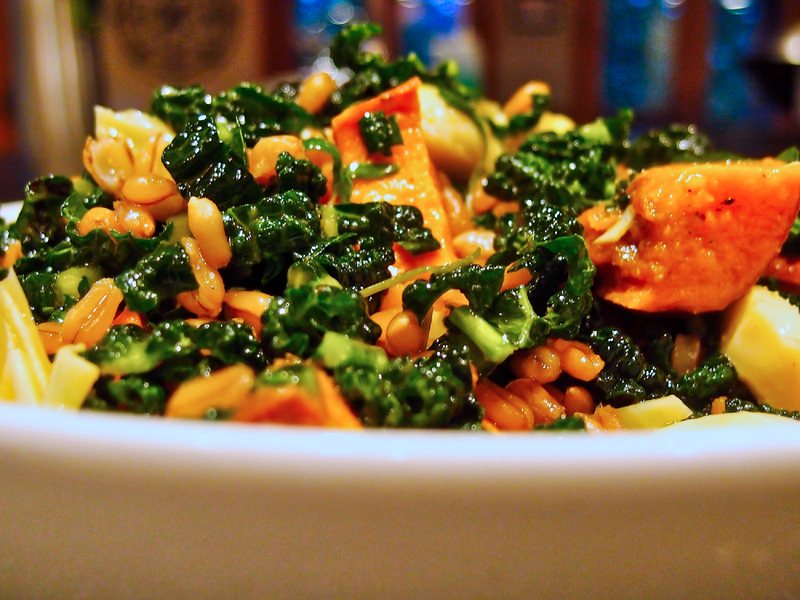 The slight bitterness of kale and the sweetness of the sweet potato are a perfect combination. Work ahead: roast sweet potatoes. Scrub sweet potatoes and cut into bite-sized chunks. Toss the sweet potato chunks with enough olive oil to lightly coat and season with salt and pepper. Roast on a sheet-pan in a 400 degree oven until tender all the way through and browned on the outside, about 30 minutes depending on the size of your chunks. Let cool. Sweet potatoes may be roasted and kept refrigerated for several days. When you are ready to assemble your salad, wash kale and dry well. Chiffonade kale by stacking leaves and slicing across the leaves into thin ribbons. Smaller leaves can be used whole, but any stems larger than a pencil should be stripped out and composted. 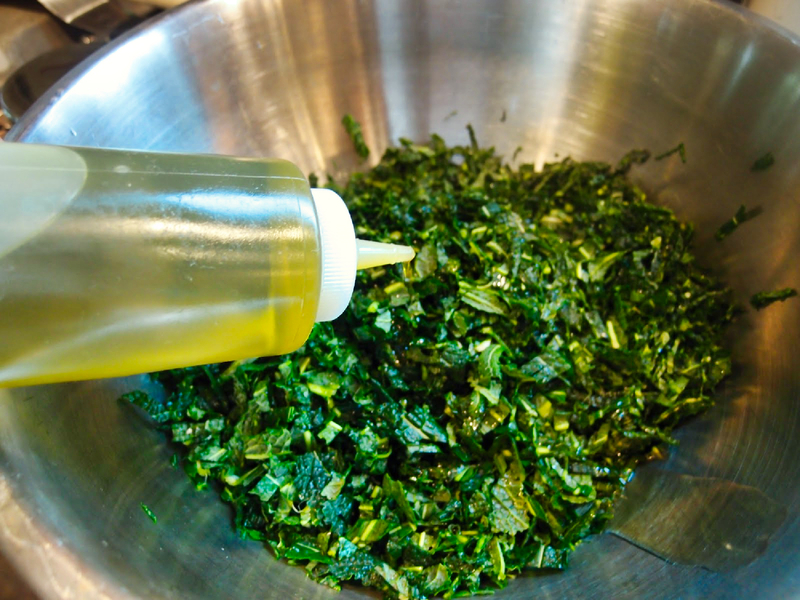 Season your kale with olive oil, vinegar, salt and pepper. Adjust seasonings to taste. 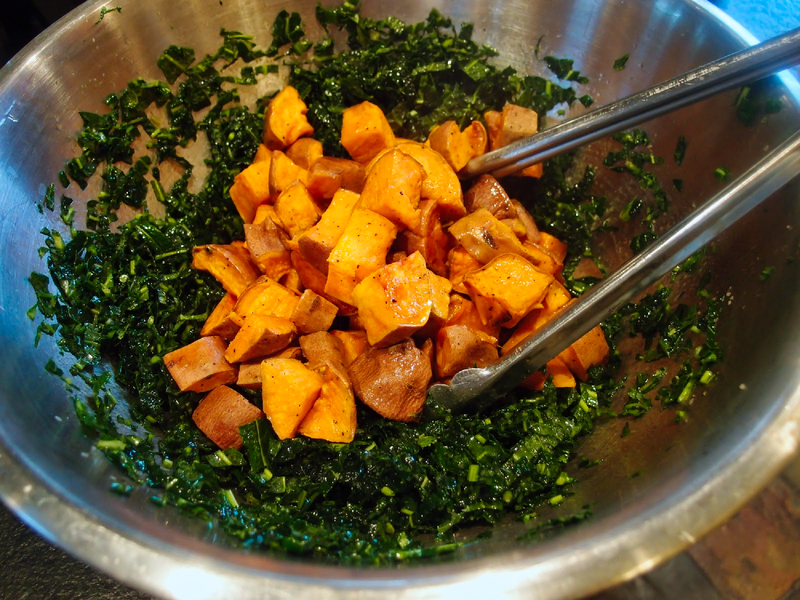 Add the roasted sweet potatoes into the kale and give everything a toss. This is a fine basic salad all by itself. But since every few weeks through the cold season, I make some variation of this salad, I like to mix it up a bit. Possibilities abound. In my most recent version of this salad I added thin-sliced onions that I marinated in a little red wine vinegar for about 20 minutes. Tasty. Nick’s favorite variation includes cooked, cooled wheat berries (or a wheat berry equivalent like spelt, tritacale, kamut, etc.). You could also add small pasta, like orzo. This makes for a very substantial vegetarian entree salad. I also like adding marinated, jarred artichoke hearts. Look how chunky and delicious that is. I’m sure there are dozens of things you could add to make this salad your own. If, like me, you live in a place where growing sweet potatoes is a bit of a fool’s quest, but you want to keep the produce 100% from the garden, you can substitute roasted butternut squash or another firm-fleshed winter squash for the sweet potato. Do you ever eat raw kale in salad? What are your favorite ways to use my favorite vegetable? Work ahead: roast sweet potatoes. Scrub sweet potatoes and cut into bite-sized chunks. Toss sweet potato chunks with enough olive oil to lightly coat and season with salt and pepper. Roast on a sheetpan in a 400 degree oven until tender all the way through and browned on the outside, about 30 minutes depending on the size of your chunks. Let cool. Sweet potatoes may be roasted and kept refrigerated for several days. When you are ready to assemble your salad, wash kale and dry well. Chiffonade kale by stacking leaves and slicing across the leaves into thin ribbons. Smaller leaves can be used whole, but any stems larger than a pencil should be stripped out and composted. Season your kale. Add the olive oil, vinegar, salt and pepper. Adjust seasonings to taste. 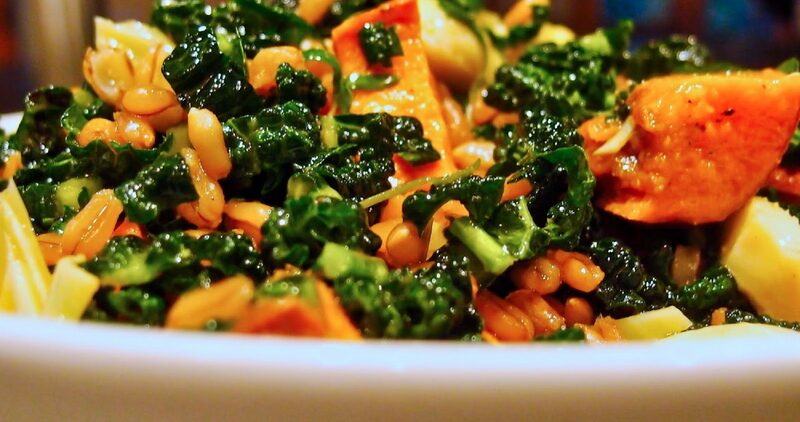 Add the roasted sweet potatoes into the kale and give everything a toss. This is a fine basic salad all by itself. Mmm. One of my favorite appetizers is Braised Kale Crostini. Even people who THINK they don't like kale eat it up. Our picky kids love kale–who would have thought?–and their favorite recipes are kale chips (toss lightly with olive oil and salt and bake in the oven until crisp, like chips) and a rough-chop kale salad that we marinate in an oil/vin/parm dressing for about half an hour before serving. I can't put any other ingredients in it, or they will pick them out. I also use kale in a Portuguese Caldo Verde soup with chorizo. Looks delicious! Have you tried the raw kale salads where you "cook" the cut kale by squeezing it in your hands repeatedly? It obviously doesn't really cook it but it does tenderize it for those who don't like it totally raw. Mmm…can't wait to try this! I only like raw kale if it's shredded quite fine. 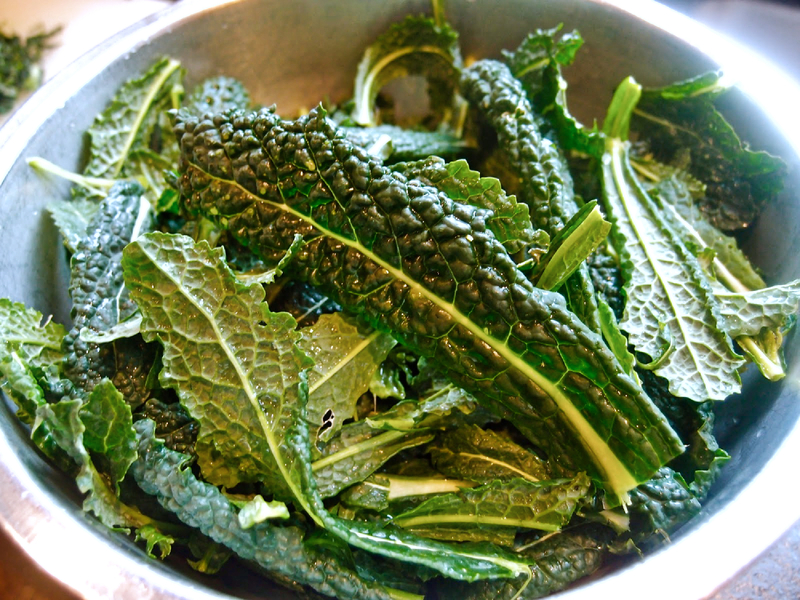 A popular dish at our house is this Kale Salad: toss finely chopped kale (Cavolo Nero pref. ), golden raisins or currants (we like dried blueberries! ), toasted nuts or seeds (pine nuts, cashews, sunflower seeds..what you like) with a dressing of olive oil, lemon juice, maple syrup, Dijon mustard, salt, pinch red pepper flakes, pepper. Amazingly delicious for raw kale! Green smoothies are also popular around here. Basically just throw a few kale leaves into the blender with your usual smoothie ingredients. A squeeze of lime is nice, too. Yummy! Oooh, these are great ideas! I'm so happy that there are other raw kale munchers out there. I am just starting to venture forth into the raw diet world and love hearing ideas for kale since it's such a powerhouse in the vitamin/mineral realm. Can't wait to try this. How long though will you have kale in your garden? I am in southern Oregon and it starts to warm up here sooner than in the upper NW areas. I am planning my garden now, but think I need to wait now until late summer to have as a winter item. Thoughts??? I have only ever had kale once and didn't really like it. I thought I should try again, seen as it is so good for you and I like other greens alot, and seeing this recipe has inspired me!! I had a salad at A16 in San Francisco, they 'massaged' the kale with salt and lemon juice and then rinsed it, served it with cherry tomatoes and little boccincini, olive oil and vinegar. It was uhmazing. Like a revelation, and I'm not being too hyperbolic.